​​​PLANO – More than three years after the groundbreaking, developers formally opened Plano's $3 billion Legacy West development. 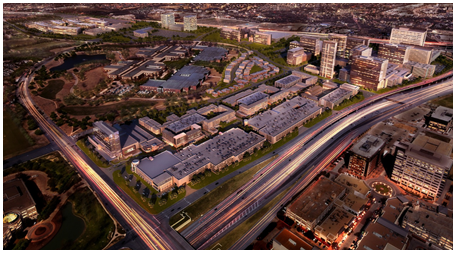 Developed by Karahan, KDC and Columbus Realty Partners, Legacy West is located on the Dallas North Tollway and SH 121. The project was built on 250 acres of surplus land surrounding retailer J.C. Penney's headquarters. This weekend's celebration is to open the Legacy West Urban Village, which has more than 300,000 sf of shops and restaurants, about 300,000 sf of office space, more than 1,000 apartments and a high-rise hotel. The retail and restaurant center and most of the office space is already rented. Aerospace giant Boeing recently announced plans to locate a new division headquarters in the Legacy West Urban Village. Liberty Mutual Insurance and JPMorgan Chase will start moving thousands more employees into Legacy West late 2017. More than 20,000 people will soon work in the development. ​Want ​more data? See DFW Retail, Office, and Multifamily Market Research.